Tired of the same old jewelry? Want to change up the style of some of your current jewelry? Like the diamonds from grandmom’s ring but not the piece’s design? Bespoke is here to save the day. Now you will want to wear all the items in your jewelry box! “Pat” enjoyed her engagement ring and wedding band wrap for almost twenty years. She loved the fact that her husband gave it to her, but she wasn’t crazy about the ring’s styling anymore. She felt the same away about her tenth anniversary ring. She wanted something more sleek and modern. That’s when she decided to turn to Bespoke Fine Jewelry to have her rings refashioned into a new ring. During her first meeting with a Bespoke representative, she described her desired style (sleek and modern) and placed the design aspect in Bespoke’s hands to make it come to life. A few days later, Pat was presented with a few different options that fit within her design parameters. 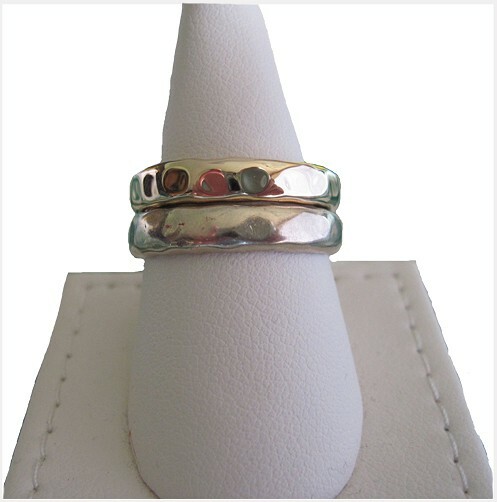 The end result was a beautiful ring that merged the three rings into one stunning one. Pat loved her new setting and was delighted that she now had a ring that went well with her current fashion tastes. Ever see a piece of jewelry and want it, but can’t find it anywhere? What about earrings you wish to wear but lost the other part of the pair? Or, how about that ring you want to have two or more so you can stack them? Bespoke has the solution! 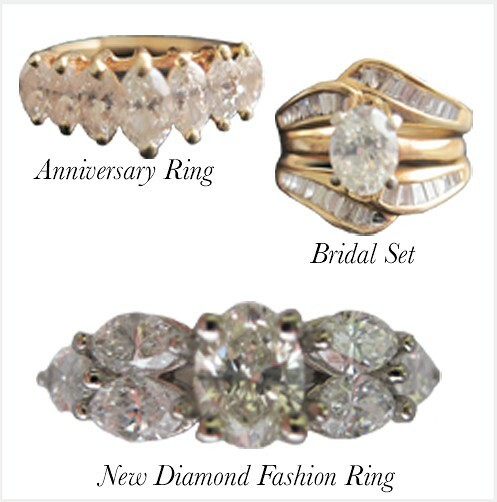 We can duplicate* almost any piece of jewelry for you. The new jewelry item can be created using a piece you currently have (see example below), a picture of the piece you wish to duplicate, or a mixture of the two. Depending on the item we can replicate the original using a mold or create a new model from a CAD design. The non-lost half of your favorite lost earrings doesn’t have fly solo anymore! One of “Ivan’s” favorite pieces of jewelry is a white gold ring with a hammer finish. He reasoned having two would be better than one. And, of course, the second one should be in a different metal color so that he could mix it up a little bit, right? Thus, Ivan reached out to Bespoke to have a duplicate ring in yellow gold commissioned. Upon receiving Ivan’s white gold ring, Bespoke set to work creating the new ring. Using the original ring a mold was made so that the yellow gold version would be exactly the same as the white gold one. A little casting, finishing, polishing and cleaning later a vibrant, bold yellow gold hammer finish ring was born. At delivery Ivan was impressed not only on how the new ring was just like his other one- just a bit more shiny- but also how fast the whole process took. He now has two great looking rings with the option of what color to chose from. A Custom Jewelry Agreement detailing the scope of the custom design that you may review and sign digitally. Because of the custom nature of the piece, we kindly ask for a 50% deposit that you may pay via PayPal before we start the design work. We will send you a picture of the final piece along with an invoice for the balance owed. Upon receipt of payment we will ship your special jewelry item via UPS 2nd Day to your select address (other shipping options are available). Note: an adult signature will be required for delivery.